Felines have been around humans for thousands of years, and the relationship was firstly based on mutual needs – cats hunted mice, while humans gave them food and shelter. A lot has changed since then and now we buy and adopt cats as our social companions and unique additions to our family. The main idea and goal of having a cat as a pet is to provide them the best possible life and enjoy their calm and soothing presence. With the relationship lasting for so long, we can now choose from hundreds of different breeds, some being natural and others manmade. 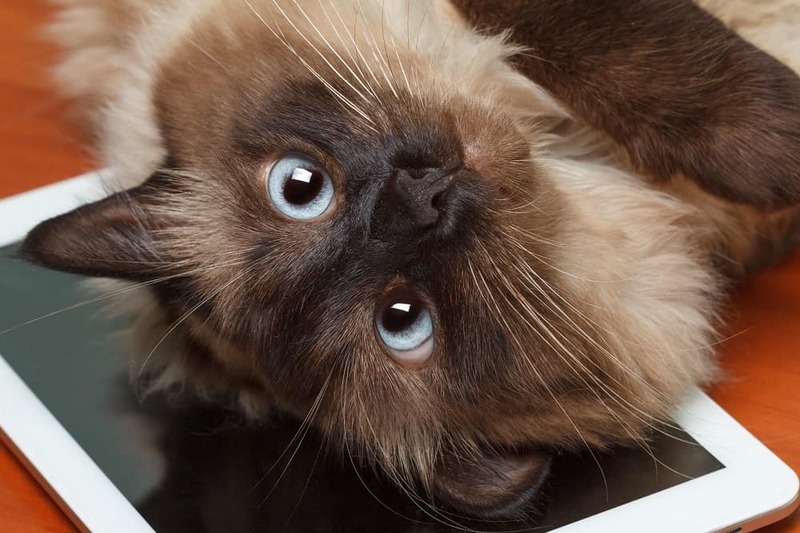 One of the most attractive cat breeds is the Siamese, and in the past few years, its long-haired version has sparked interest in thousands of people. Yes, we are talking about the Balinese Cat. What's the nature of the breed? How much does a Balinese Cat cost? If you know what a Siamese cat is like, you have a pretty good idea of what the Balinese cat is like as well. With the only difference being that Balinese cats aren’t as loud, other personality traits remain the same. A Balinese cat is highly intelligent and playful, enjoying socialization at any given moment. You shouldn’t get this breed unless you have enough time on a daily basis to spend with your feline friend. They love being helpful and will follow you around the house whatever you do. And at nighttime, you can expect them in your bed. While Balinese cats are seen as a natural breed, it is still not sure if they are a result of genetic mutation or mixed breeding between a Siamese cat and its long-hair counterparts such as an Angora or a Persian cat. Either way, Balinese cats started appearing back in the 1920s and were named after the Bali island dancers. As mentioned above, a Balinese cat is actually a long-hair Siamese cat (excluding the possibility of cross-breeding) and it took some time before it was officially recognized. While it was registered back in 1928, and its mass popularity began in the 1940s, only in 1961 did the CFF recognize it as an official breed (long-hair Siamese cat), followed up by CFA in 1970. Since then, its popularity has continued to grow, while the breed was accepted by numerous other organizations such as ICA, and ACFA. Now, this breed stands as one of the most popular long-haired breeds and has millions of people that are fond of it. The development of this breed is particularly interesting, as the Balinese cat looked quite different one century ago to what it looks now. When it first appeared, the long-haired Siamese version was much heavier and had thicker bones than the regular Siamese cat. Along with that, its face was not a wedge but rather apple-shaped, and it had a double coat. 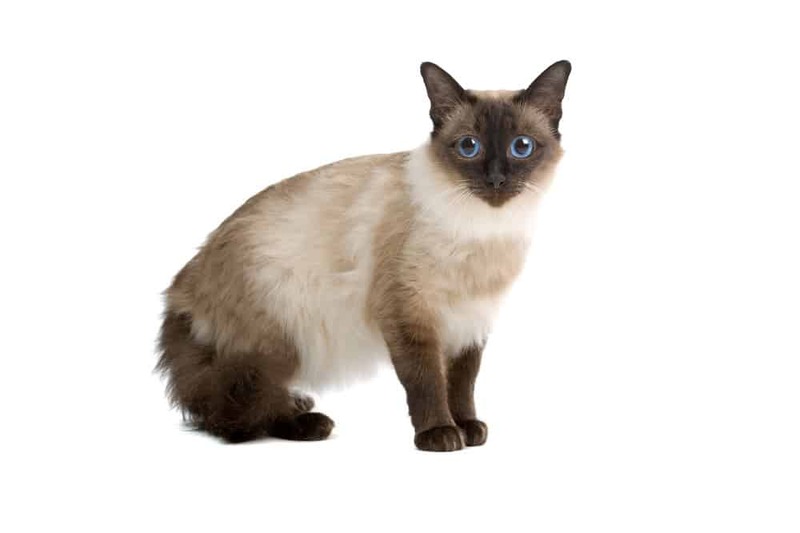 Breeders were not satisfied with such looks, and after decades of cross-breeding with regular Siamese cats, we know have a Balinese that is much more similar to its counterpart. A Balinese cat range from 6 to 10 pounds, with males reaching up to 12 pounds in weight. It has a wedge-shaped face and a slim neck, with a firm chin and sapphire blue almond-shaped eyes. Similar to original Siamese cats, it has pointy ears that are wide at the bottom and narrow at the top. As for its coat, it is one of the rare long-hair breeds that doesn’t shed a lot. In fact, it has a single coat that is close to the body. Still, its coat doesn’t lack anything and it has the required silkiness and fluffiness of a long-haired breed. Owners don’t have to invest nearly as much time in grooming as they would have to do with a Persian or an Angora cat. A Balinese comes in four color variations: lilac point; blue point; seal point; and chocolate point. The average lifespan of this breed is not certain, but most of the organizations claim it to be between 16 and 20 years, which is particularly long for a cat breed. This is the result of the long-hair genetic mutation (long-hairs usually live longer) and a later crossing with the short-hair Siamese cat. There are a number of health conditions that might occur and that should be addressed as soon as detected. The most common issue is crossed eyes and this mostly occurs as a consequence of inbreeding. Along with that, a hereditary liver disease called amyloidosis as well as asthma and progressive renal atrophy are possibilities. While this cat doesn’t shed nearly as much as its long-hair counterparts such as Angora, Somali, or Persian cats, it still asks for a few weekly grooming sessions. Apart from that, you will be good with giving it a bath once a month, and regularly cleaning their ears and trimming their nails. With proper care and adequate nutrition, your Balinese cat should be in for a long and healthy 20 years of life. The answer to this question depends on where you live, but in most of Europe, the Americas, Asia, and Australia you can find one by visiting your local breeders. Still, you should check their history before making a final decision and be sure that they provide you a health guarantee. Along with that, you can look for online breeders that might ship a Balinese cat to your area. Our recommendation is to save money while saving a life and adopt one. There are a number of Balinese cats that either end up as strays or get lost, and they are waiting for your kindness and love. Well, same as the previous answer, this depends on where you live, but an average price ranges from $1,200 to $1,500. Yes, Balinese cats are not cheap, and that is mostly due to their rising popularity and attractive looks. This doesn’t mean that you are left without a choice – on the contrary, adopting a Balinese will not cost you more than $100 and will be a great act of kindness. 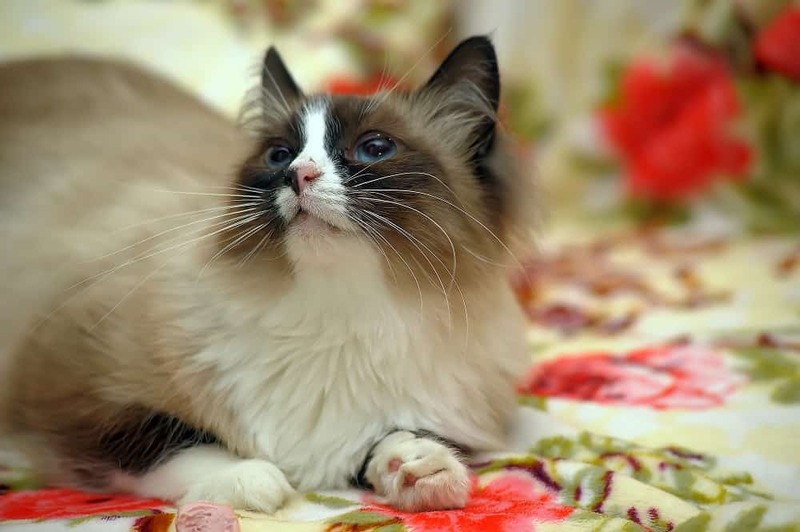 The looks of a Balinese cat now differ from what they were like 100 years ago, and that is why there are a few points you should consider when buying or adopting one. Firstly, it should have a wedge-shaped face and sapphire blue almond-shaped eyes. Along with that, no pattern other than the point is recognized, and Balinese cat comes in only four colors – lilac, seal, blue, and chocolate. The hind legs should be somewhat longer than the front ones, and the Balinese cat should have an overall elegant and slim body structure. If you are thinking about buying or adopting a Balinese cat, you should consider the responsibilities that come along with owning one. Balinese cats are a highly social breed that require a lot of attention and playtime. If left unstimulated, they might get destructive and destroy your furniture, carpets, etc. If you are not compatible with a highly talkative pet, a Balinese might not be the right choice for you. While it is not as loud as a Siamese cat, it is not afraid to express its opinions and demands. On the other hand, as Balinese cats are best suited for indoor life, you should do your best and allow them the right conditions for a happy and active life. Outdoors shouldn’t be an option (apart from a fenced play area in the backyard), as it carries a risk of abduction, diseases, and other animals that might kill or harm your cat. While being a cat owner is a beautiful thing, it comes with a huge responsibility, and for some, it might be too much. One of the most important things when looking for the right cat breed is to know its personality traits, and a Balinese cat is pretty unique when it comes to that. First, it is a highly social breed and you can expect that it will be around you for most of the time – whether you are preparing a meal or relaxing on your sofa. Along with that, they are very intelligent and are not afraid to show their talkative side. Being active and playful, they will need at least a few hours of mental and physical stimulation every day in order to keep healthy and in line with household rules. When it comes to the question of if Balinese cats are child- and dog-friendly, we can give you a positive answer. They are affectionate and can be a great companion for your children as the cat will enjoy playing and fetching balls and sticks that your children throw. Balinese cats adore retrieving toys, much like dogs. When we are talking about dogs, Balinese cats are pretty tolerant and will happily live with a canine friend if properly introduced. Given the various pattern types, only one is recognized in the official Balinese breed and it is the point pattern. There are four accepted colors, all of which are the same as with a Siamese cat: lilac point; seal point; blue point; and a chocolate point. With the Balinese cat having so many traits, we can compare it to numerous breeds. Given its personality, it is similar to both Siamese cats as it is talkative and playful, as well as Angora, being highly social and affectionate. On the other hand, while its looks are pretty similar to a short hair Siamese, it still does resemble an Angora or a Persian cat, mostly due to its long coat and plush tail. If you are a fan of long-haired cats but you love the sapphire blue eyes and wedge-shaped face, a Balinese cat is the right choice for you. Very similar to the Siamese cat, it is perfect for a family that has children and other pets as they are an affectionate, intelligent, and playful breed that will prove to be a great companion.